LOS ANGELES, CA / ACCESSWIRE / December 3, 2018 / StockNewsNow.com, The Official MicroCap News Source™, today published an SNNLive Video Interview with Curtis Moore from Energy Fuels Inc. (NYSE American: UUUU) (TSX: EFR), the largest uranium producer in the United States, and it is about to become the only primary producer of vanadium in North America, according to the company’s website (see here: www.energyfuels.com). The video interview was recorded at the New Orleans Investment Conference 2018 on Saturday, November 3, 2018. Energy Fuels is a leading integrated US-based uranium mining company, supplying U3O8 to major nuclear utilities. Its corporate offices are in Denver, Colorado, and all of its assets and employees are in the western United States. Energy Fuels holds three of America’s key uranium production centers, the White Mesa Mill in Utah, the Nichols Ranch Processing Facility in Wyoming, and the Alta Mesa Project in Texas. The White Mesa Mill is the only conventional uranium mill operating in the U.S. today and has a licensed capacity of over 8 million pounds of U3O8 per year. The Nichols Ranch Processing Facility is an ISR production center with a licensed capacity of 2 million pounds of U3O8 per year. Alta Mesa is an ISR production center currently on standby. Energy Fuels also has the largest National Instrument 43-101 compliant uranium resource portfolio in the U.S. among producers, and uranium mining projects located in a number of Western U.S. states, including one producing ISR project, mines on standby, and mineral properties in various stages of permitting and development. 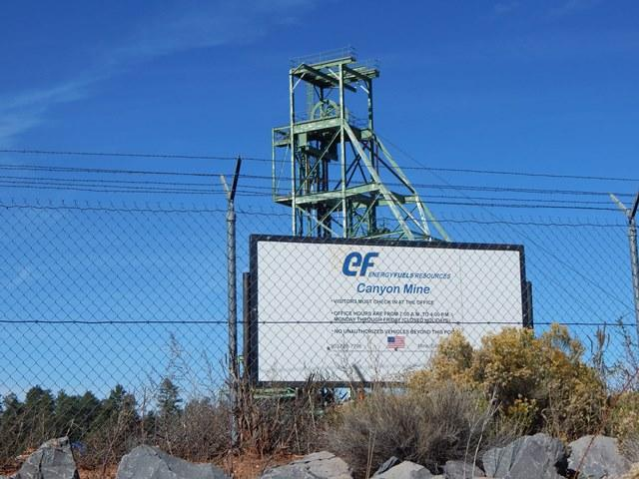 The Company also produces vanadium as a by-product of its uranium production from certain of its mines on the Colorado Plateau, as market conditions warrant. The primary trading market for Energy Fuels’ common shares is the NYSE American under the trading symbol “UUUU”, and the Company’s common shares are also listed on the Toronto Stock Exchange under the trading symbol “EFR”. Energy Fuels’ website is www.energyfuels.com.